Here you find a list of most frequently asked questions. 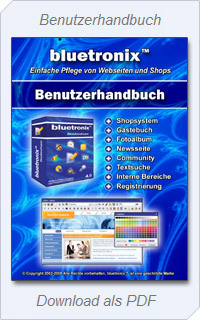 I have got a website already but I would like to use the bluetronixTM software. Can I move to bluetronix? Yes, you can import your existing website. You will not have to start from scratch. See also unit "Importing an existing homepage" in the manual. The domain transfer of your domain is free of charge. No, there is no minimum contract period. You can cancel your subscription at any time to the end of the respective month. Can I upgrade to another web package or extend my subscription in any other way? Yes, you can upgrade your subscription to our web packages conveniently in the editing mode. What system requirements are necessary? To use bluetronixTM cms software, you need a computer with internet access and Microsoft® Internet Explorer version 5.5 or higher. Mac® users need Windows® desktop installed. Note! This is neccessary just for creating and editing web pages, while it is possible to view the website with any other browser. Is the software suitable for beginners or will I have to be a programmer? Yes, bluetronixTM cms software is suitable for beginners and is very easy to handle. There is a comprehensive manual available. You don't have to know programming languages or HTML. See also unit "Quickstart" in the manual. What does it mean: 'ready to go website'? With subscribing to a web package you will get a 'premanufactured' website including different templates (layouts). These are used to be an easy entry an can be changed with a few clicks to fit navigation and layout to your needs. You will only have to fill in the content. You may change every detail of your website. Even though the website is ''premanufactured' you can feel free to make changes in layout, design, navigation or add modules (depending on the web package you have chosen). Can I design a complete new website? Yes you can delete all pages an begin from the scratch with your individual professional website with the help of bluetronixTM software. Can I create an own layout or will I have to buy a template? Yes you can adapt the given layouts with your own images, buttons, backgrounds to your needs. The templates are only optional add-ons and not essential to create a website. What is the file format of the pages? The pages are saved in HTML format. How much will software updates cost? How are to install updates? Software updates are for free. You will always be using the latest version of the bluetronixTM cms software because software updates run automatically on the server. How will I receive an order from the the shopping cart? All orders you can read in the internal form system of the bluetronixTM software. Forwarding via email is also possible. Can I optimise my website for search engines with the help of the bluetronixTM software? Yes you can assign keywords, title and author to each page of your website. Some advice for search engine optimisation is given in our manual, see also unit "Site settings". How will I get the bluetronixTM software? Will I have to install it? You get your log-in details directly after you have ordered one of the web packages. On request you can get your log-in details by mail or by email. The software is installed at the server - no local setup of the bluetronixTM software is required. Three different layouts are included. Go online, log in and get started! Can I buy the bluetronixTM software without subscribing to one of the web packages? No, this is not possible. To run this software you will need an especially configured server. This software does not run on a common server provided by other webspace providers.